Choose a Do you want us to bend this Shoulder Rest? No thank you, Please send as it is. Yes, Please bend it. 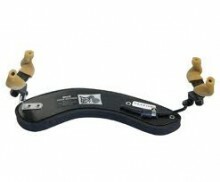 - - Wide, contoured rest with flexible legs for angle adjustments. - - Offers the option of more height than any other shoulder rests. Provided with two telescopic screws on both sides. To any height between 0,5 and 8 cm. To any angle and any width. Suggestion: On our 'Magic Posture' page, you can watch our video about the Magic Posture in which we use a Wolf Forte Secondo shoulder rest and a Teka chin rest combination. You may find that it is a better option to buy the combination, rather than just buying a wolf shoulder rest, particularly for musicians with a long neck and a slim shoulder. Click the button below to add the Violin Shoulder Rest Willy Wolf: Forte Secondo - All Sizes to your wish list.